A Pathfinder Roleplaying Game GM’s Resource supplement by loads of great designers. Bored of giving out the same old treasures? Find yourself describing hoards that include “gems worth 100 gp,” “a piece of jewelry worth 500 gp or a masterwork long sword?” Want to add in more flavor to your treasure hoards, but simply don’t have the time to create them yourself? 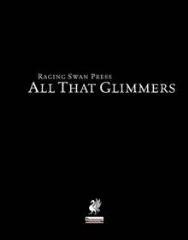 All That Glimmers not only contains all the material originally presented in So What’s The Hoard Like, Anyway? ; So What’s The Hoard Like, Anyway II? ; So What’s The Hoard Like, Anyway? III; So What’s That Shiny Thing, Anyway? ; So What’s The Armor Like, Anyway? ; So What’s The Weapon Like, Anyway? ; So What’s The Spellbook Like, Anyway? and So What’s For Sale, Anyway? V but also includes over a dozen pages of new, never seen before material on intelligent items and treasure maps from designers Landon Bellavia and Creighton Broadhurst!